After receiving a surprising diagnosis, Patty Brown navigated her multiple myeloma treatment with support, guidance and care from her Mayo Clinic team — and a few pancakes. Patty Brown was simply going in to catch up on some routine lab work she'd put off related to her Crohn's disease. But what began as routine turned out to be the start of something much more. After running the tests, her gastroenterologist called and told her the results weren't what he was expecting. "He wanted to repeat the labs in a couple of weeks," Patty says. "So he did, and they were still out of whack." Her doctor referred her to a hematologist-oncologist. Before she could get there, however, a bowel obstruction landed her in the hospital near her home in Arizona. Additional lab work also showed abnormal results. That led her care team to perform a bone marrow biopsy. Results of that test were also concerning. 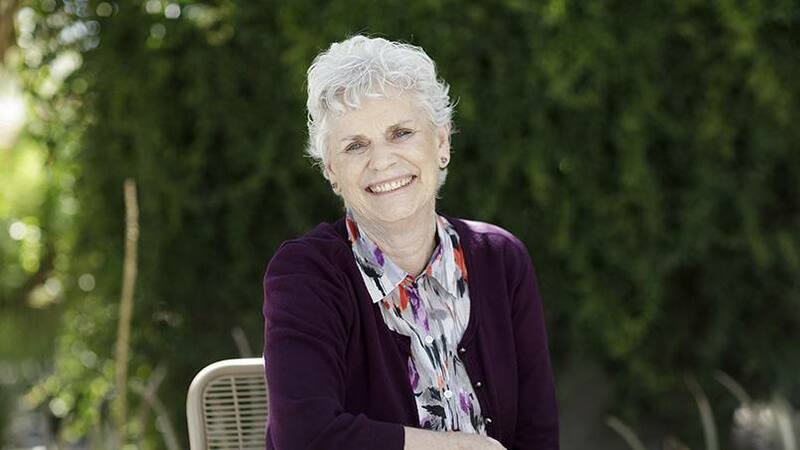 A subsequent meeting with her gastroenterologist led to one more referral for Patty. "He said, 'You need to go see Dr. Keith Stewart at Mayo Clinic," Patty recalls. "He's one of the foremost authorities in the world on multiple myeloma, and that's what's showing up here." The diagnosis of multiple myeloma — a cancer that affects the blood's plasma cells — shocked and worried Patty. But having worked as a medical secretary at Mayo Clinic's Arizona campus for the past 12 years, she took some comfort in knowing exactly where she was going for care, and she was confident that the care there would be excellent. At Mayo Clinic, Dr. Stewart confirmed Patty's diagnosis and started her on chemotherapy treatments right away. After some time, and some tweaks to her "chemo cocktail," Dr. Stewart presented Patty with a second treatment option. "He said I could continue doing the chemo, and then wait and see what happened or, because my general health was good and I was still relatively young, I could also consider having a bone marrow transplant," Patty says. Patty chose to have the transplant, which would be performed after her remaining four months of chemo treatments. Then, in December 2010, the team planned to collect the stem cells. Before any of that took place, Patty had a chance to eat a few pancakes. Actually, more than a few. "The first time I went in for chemo, my sister went with me, because I had no idea what side effects I might have," Patty says. "My care team told me to eat first, so we went over to a local pancake house." Patty says the pancake thing took off from there. "I didn't get sick or feel nauseated after my initial treatment, so the following week, I said 'Well, I'm going back for more pancakes,'" she says. "A couple people in my family came with me" and soon, "every week we had a standing appointment at the local pancake house before my chemo treatments." "We had our same table there, and whoever in my family could make it that week would come with me," Patty adds. "The support of my friends and family through the simple act of sharing pancake breakfasts was such a vital part of helping me get through the treatments." At the end of her chemo regimen, when her team told her that her cancer was in remission, Patty provided a playful explanation for her care providers. "I joked with them that it wasn't the chemo that cured me, it was the pancakes," she says. "I did eat a lot of them." Due to the nature of Patty's disease, being in remission did not negate her need for a bone marrow transplant. "Multiple myeloma's generally thought to not be a curable disease," Dr. Stewart says. "Most of our patients will experience a chronic relapsing form of the illness." With everything in place and ready to go, Dr. Stewart deferred to Patty to decide on the next move. "He said I could go in and have the transplant at the end of December, and that I might be in the hospital for up to 30 days afterward," Patty says. "I remember telling him I didn't want to be in the hospital over the holidays, and that I'd rather do it in January, so we scheduled it for then." There was one thing they still had to work out. "He kept thinking I was going to chicken out. I guess because I was so nervous about the transplant," Patty says. "He would tell me, 'You don't have to do this. We can wait right up until the minute they're ready to transplant the cells into your body and you can say 'Let's not do this, let's wait.' And I told him, 'I'm not going to back out. I'm just nervous.'" When the day of Patty's transplant finally came, it didn't take long for the nervousness to fade. "It was way easier than I thought it was going to be," she says. "I don't know exactly what I was expecting, but you don't really feel a thing. You just get this funny taste in your mouth. Looking back, the whole experience was actually great." Patty says her body felt great after the transplant, too — for the first few days. "Then I felt like I'd been run over by a truck," she says. "But Dr. Stewart had told me that was going to happen. He told me it would take about seven days to reach my lowest point, and then I would start to feel my energy and strength come back, and he was right." Patty says she'll be forever grateful to the place that's now cared for her equally well as both a patient and an employee. "You go everywhere and hear about how great Mayo Clinic is and see all of the awards we've won," she says. "It's different when you're on the other end, and you see it all in action. It definitely gives you a greater appreciation for all of the brilliance and expertise we have here." Connect with others talking about multiple myeloma on Mayo Clinic Connect.